Hitachi general-purpose atomic force microscope, Model AFM5100N, features superior ease of use, a wide range of capabilities, and extraordinary performance. 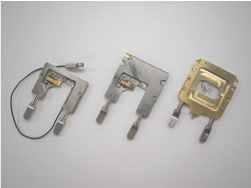 The breakthrough hardware option, the self-sensing detector, doesn’t require laser and detector alignments and thus can effectively simplify AFM operation. As a full-featured system in support of high-resolution and multifunctional AFM measurements, the AfM5100N offers a wide variety of advanced modes including the proprietary sampling intelligent scan (SIS) that can deliver previously unattainable results for very challenging samples. The Hitachi AFM5100N Atomic Force Microscope is a compact, general-purpose AFM equipped with a built-in high-resolution sensor lever for manual operation. 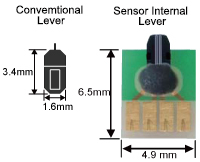 In conventional models, levers are very small and difficult to handle, but the internal sensor lever of the AFM5100N is large and easy to install and operate. With the optic lever, adjustment is required to align the laser axis to the cantilever. 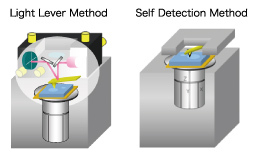 With the self-detection system of the AFM5100N, it is no longer necessary. 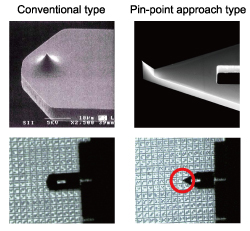 The cantilever is designed to allow verification from directly above the position of the probe tip. Positioning of the measurement area is made easy. Also, high resolution is acheived by sharpening the probe. Isolation mechanism, wind shield cover, top USB camera enabling observation of sample, and cantilever are all combined in a compact instrument. With a flow-chart navigation system, observing high-resolution surfaces is now a breeze for any user. Setting measurement parameters can also be done by simply following a wizard-style procedure. 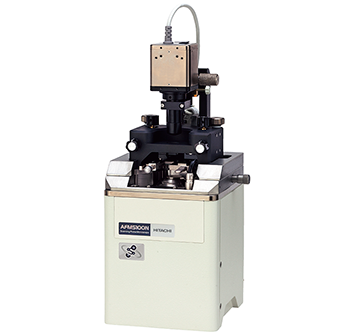 The AFM5100N accommodates various functions via the alignment of the optic lever method. Also, change to the light lever method is completed by inserting one cable.